A thermometer is a must-have item for any parent with a baby or small child. Babies and children are prone to infections and being able to monitor their temperature is essential. There is a wide range of digital thermometers available. Old-school mercury thermometers are now no longer recommended due to health and environmental concerns. What Type of Digital Thermometer? Ear thermometers (Tympanic) provide the most accurate and quick readings in babies and small children. However, other types of thermometer are available. Forehead thermometers may be better tolerated by the child, however, these are less accurate. Rectal thermometers also provide very accurate readings but are less common. Braun is a German manufacturing company that produces high-quality digital thermometers. We like their ThermoScan range of digital thermometers. There are several varieties on the market, the Braun ThermoScan 5 provides an excellent thermometer at a reasonable price. Braun thermometers are trusted by healthcare professionals across the world to provide accurate temperature readings. 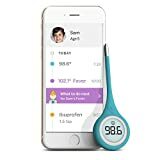 This ‘Smart’ thermometer will connect to your smartphone allowing you to track temperature readings. The smartphone app also provides basic self-care advice and further information on how to manage your child’s fever. 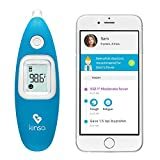 Our team was impressed with the Kinsa range of digital thermometers when we tried them at home. The smartphone integration is especially handy and provides useful self-care information.